The DGX-1 includes a baseboard management controller (BMC) that lets you manage and monitor the DGX-1 independently of the CPU or operating system. 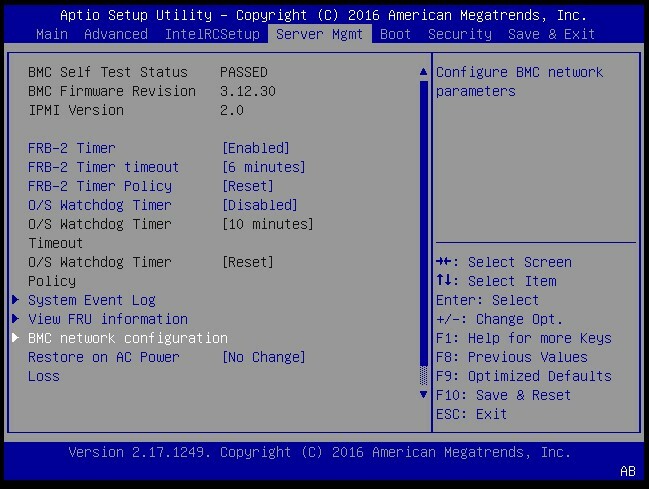 You can access the BMC remotely through the Ethernet connection to the IPMI port. This section describes how to access the BMC, and describes a few common tasks that you can accomplish through the BMC. It is not meant to be a comprehensive description of all the BMC capabilities. Make sure you have connected the IPMI port on the DGX-1 to your LAN. Open a Java-enabled browser within your LAN and go to http://<IPMI IP Address>/. Use Firefox or Internet Explorer. Google Chrome is not officially supported by the BMC. Log in. Your initial log in credentials are based on the ones you created when you first set up the DGX-1. Enter your username for both the User ID as well as the Password. User ID: <your username> Password: <your username>. Be sure to change your password immediately to ensure the security of the BMC. See the next section for instructions on how to change your BMC password. When you set up the DGX-1 upon powering it on for the first time, you set up a username and password for the system. These credentials are also used to log in to the BMC remotely, except that the BMC password is the username. It is strongly recommended that you create a unique password as soon as possible. Open a Java-enabled web browser within your LAN and go to http://<IPMI IP address>/. Use Firefox or Internet Explorer. Google Chrome is not officially supported by the BMC. From the top menu, click Configuration and then select User. Select your username and then click Modify User. In the Modify User dialog, select Change Password, and then enter your new password in the Password and Confirm Password boxes. The BMC opens to the dashboard, which shows information about the system and system components, such as temperatures and voltages. The BMC provides automatic logging of system activities and status. The NVIDIA Enterprise Support team uses the log files to assist in troubleshooting. 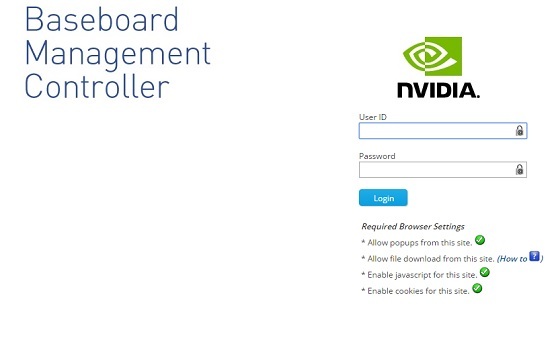 Follow these instructions to obtain the log files to send to NVIDIA Enterprise Support. 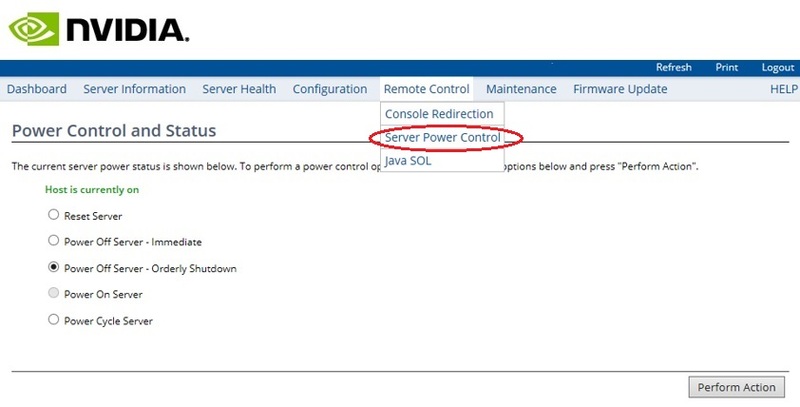 Log into the BMC, then click Server Health from the top menu and select Event Log. Make sure that Text is selected at Format of Download Event Logs. Click Save Event Logs to download the event logs. 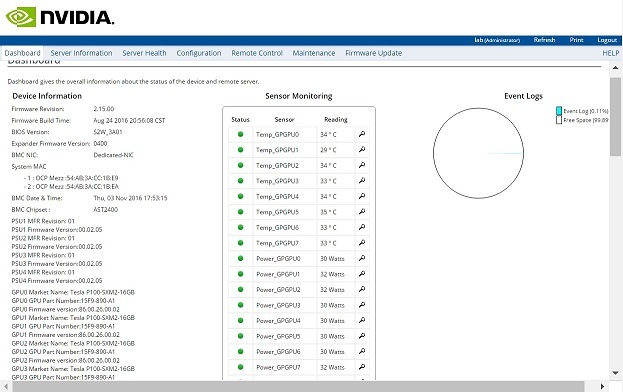 From the BMC dashboard, locate the Sensor Monitoring area and then scroll down the page until you see the PSU Input rows. Add the values for all the PSUs. In this example, the total power consumption would be 216+216+135+27 = 594 watts. The DGX-1 BMC uses JViewer to view the console. Note: To use JViewer with Mac OS, first install XQuartz, available from https://www.xquartz.org. From the top menu, click Remote Control and then select Console Redirection. Click Java Console to open the popup window. The window provides interactive control of the DGX-1 console. From the JViewer top menu, click Power and then select from the available options, depending on what you want to do. Click Yes and then OK at the Power Control dialog, then wait for the system to perform the intended action. From the top menu, click Remote Control and then select Server Power Control. Select from the available options according to what you want the system to do, then click Perform Action. 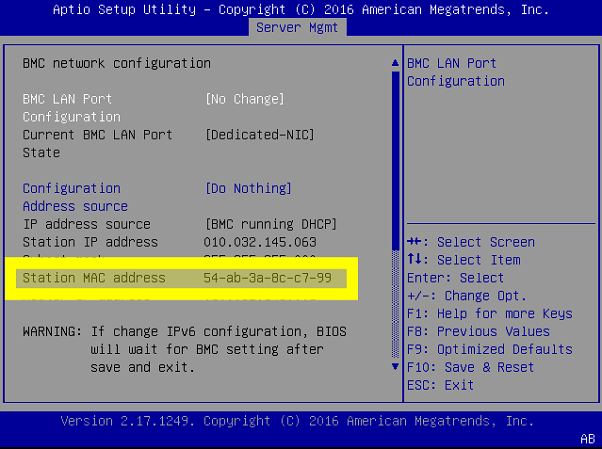 This section explains how to set a static IP address for the BMC. You will need to do this if your network does not support DHCP. 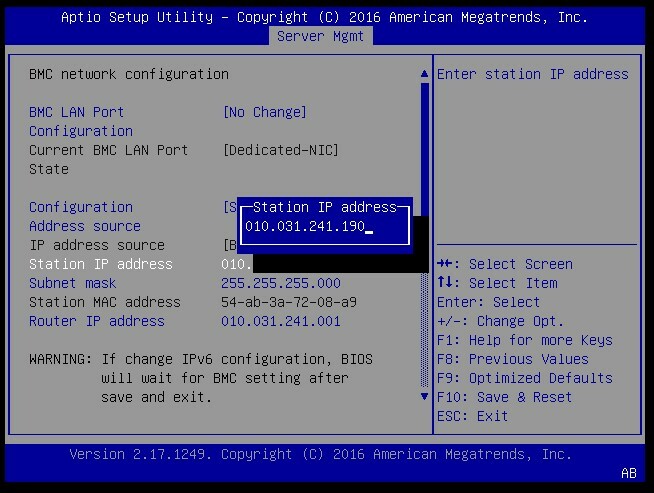 This section describes how to set a static IP address for the BMC from the Ubuntu command line. 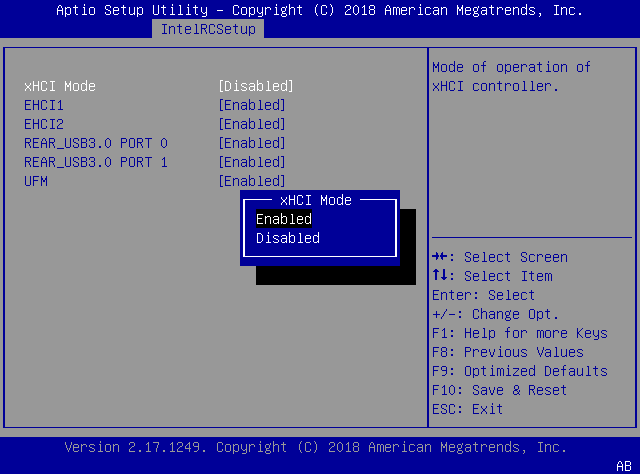 Note: If you cannot access the DGX-1 remotely, then connect a display (1024x768 or lower resolution) and keyboard directly to the DGX-1. To view the current settings, enter the following command. To set a static IP address for the BMC, do the following. Set the IP address source to static. Set the appropriate address information. To set the IP address (“Station IP address” in the BIOS settings), enter the following and replace the italicized text with your information. To set the subnet mask, enter the following and replace the italicized text with your information. To set the default gateway IP (“Router IP address” in the BIOS settings), enter the following and replace the italicized text with your information. This section describes how to set a static IP address for the BMC when you cannot access the DGX-1 remotely. 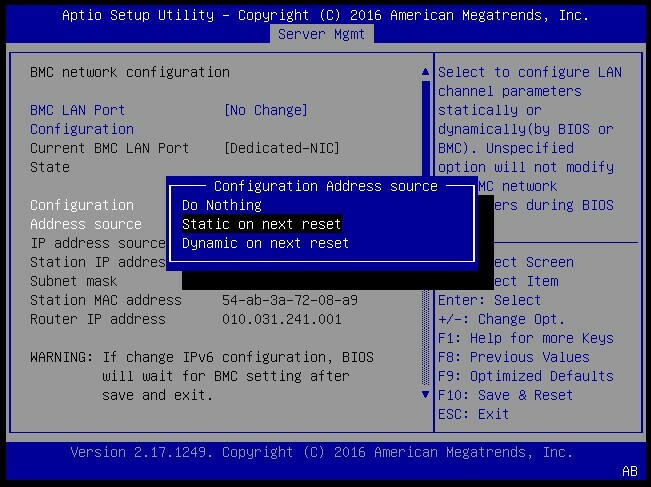 This process involves setting the BMC IP address during system boot. Connect a keyboard and display (1024x768 or lower resolution) to the DGX-1, then turn on the DGX-1. 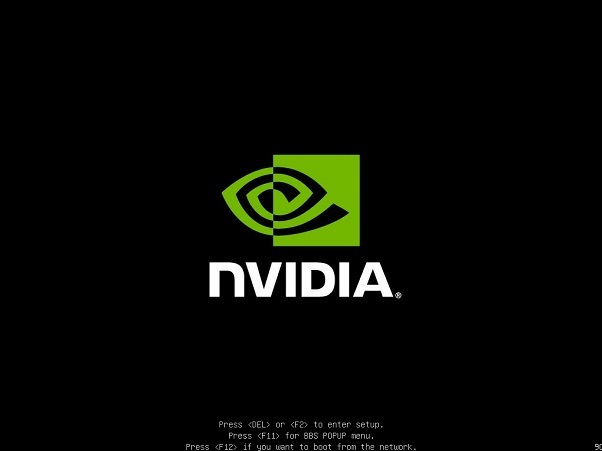 When you see the NVIDIA logo, press Del to enter the BIOS Utility Setup Screen. 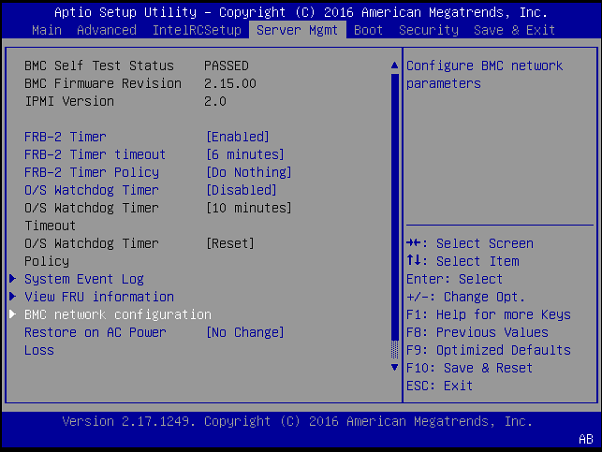 At the BIOS Setup Utility screen, navigate to the Server Mgmt tab on the top menu, then scroll to BMC network configuration and press Enter. Scroll to Configuration Address Source and press Enter , then at the Configuration Address source pop-up, select Static on next reset and then press Enter. Scroll to the specific item and press Enter. Enter the appropriate information at the pop-up, then press Enter. When finished making all your changes, press F10 to Save & Reset, then select Yes at the confirmation pop-up and press Enter. You can now access the BMC over the network. 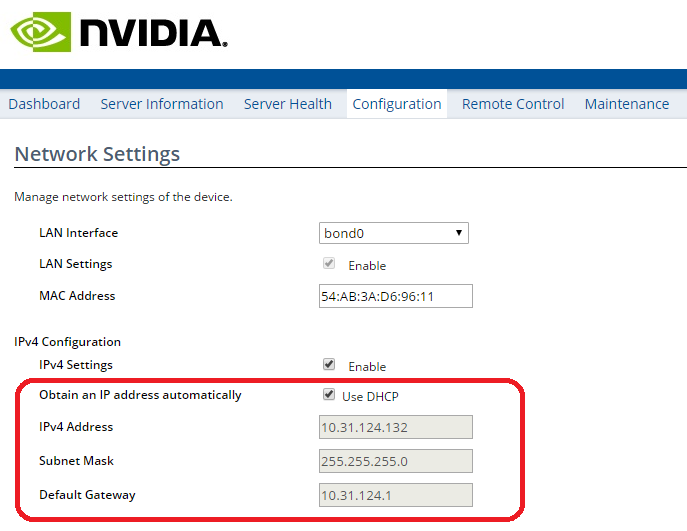 Log into the BMC, then click Configuration from the top menu and select Network Settings. In the IPv4 Configuration section of the Network Settings page, clear the Use DHCP check box, and then enter the appropriate values for the IPv4 Address , Subnet Mask , and Default Gateway fields. During the initial boot setup process for the DGX-1, you had an opportunity to configure static IP addresses for the network ports. If you did not set this up at that time, you can configure the static IP addresses from the Ubuntu command line according to the following instructions. Determine the port designation that you want to configure, based on the physical ethernet port that you have connected to your network. Consult your network adiminstrator for the appropriate addresses for your network, and use the port designations that you determined in step 1. When finished with your edits, press ESC to switch to command mode, then save the file to the disk and exit the editor. Restart the network services to put the changes into effect. These instructions explain how to determine the MAC addresses for the IPMI port (BMC) as well as both ethernet ports of the DGX-1. The ports are, from left to right, IPMI (BMC), em2 (or enp1s0f1), em1 (or enp1s0f0). Connect a display (1024x768 or lower resolution) and keyboard to the DGX-1. Turn the DGX-1 on or reboot. At the NVIDIA logo boot screen, press [F2] or [Del] to enter the BIOS setup screen. 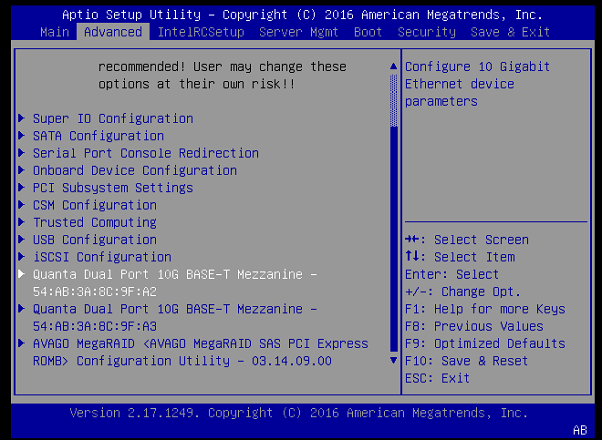 Select the Advanced tab from the top menu, then scroll down to view the two Quanta Dual Port 10G BASE-T Mezzanine items. The first item shows the MAC address for ethernet port em1, and the second item shows the MAC address for em2. Navigate to and select Server Mgmt from the top menu, then scroll down to and select BMC network configuration. Scroll down to view the Station MAC address. This shows the MAC address for the BMC. The NVIDIA® DGX-1™ GPUs may need to be reset during maintenance or repair work. For example, when a GPU presents Double Bit Errors or repeat Single Bit Errors in the same location, pages are retired. For the retired pages to be blacklisted (unavailable to the user/application), the GPU needs to be reset. In the case of the DGX-1 platforms, individual GPUs cannot be reset because they are linked via NVLink, so all the GPUs must be reset simultaneously. The simplest way to reset all the GPUs in the system is to reboot the system. If this is too disruptive and you need to keep the system booted, then this section explains how to reset the GPUs without rebooting the system. Check for running applications, using nvidia-smi. Stop NVIDIA processes, using systemctl. Reset the GPUs, using nvidia-smi. Re-enable NVIDIA processes, using systemctl. Check if there are any applications running on the GPUs. If DGX OS server version 3.x is installed and DCGM is being used to monitor GPUs, make sure to shut down the host engine (daemon). If the DGX-1 system is being monitored by any application or agent that is watching the GPUs (for example, Nagios), those applications or agents should also be shut down. Run nvidia-smi to confirm the applications have been closed. As a final check, verify that no applications or agents are running on the GPUs. If any processes are listed, be sure stop or kill them before proceeding with the next section. To reset the GPUs, do the following. GPU 00000000:06:00.0 was successfully reset. GPU 00000000:07:00.0 was successfully reset. GPU 00000000:0A:00.0 was successfully reset. GPU 00000000:0B:00.0 was successfully reset. GPU 00000000:85:00.0 was successfully reset. GPU 00000000:86:00.0 was successfully reset. GPU 00000000:89:00.0 was successfully reset. GPU 00000000:8A:00.0 was successfully reset. Enable nvidia-persistenced, nvidia-docker, and any other monitoring agents and applications that were stopped earlier as described in the previous section. Run the following command only if DGX OS server 3.x is installed and DCGM was being used. Data center environments can vary in the type of network connectivity used. The NVIDIA DGX-1 system is equipped with eitheer 4 Single port Mellanox ConnectX-4 VPI MCX455A-ECAT modules or 4 Single port Mellanox ConnectX-5 VPI MCX555A-ECAT modules. By default these are configured as Infiniband ports, but you have the option to convert these to Ethernet ports. In order for these changes to work properly, the configured port must connect to a networking switch that matches the port configuration. In other words, if the port configuration is set to Infiniband, then the external switch should be an Infiniband switch with the corresponding Infiniband cables. Likewise, if the port configuration is set to Ethernet, then the switch should also be Ethernet. Switch to the download directory mft-4.6.0-48-x86_64-deb/ and then run the installation script. To verify that the Mellanox Software Tools (MST) services are running, enter the following. The following output indicates the services are not running. The following output indicates the services are running. /dev/mst/mt4115_pciconf0 - PCI configuration cycles access. /dev/mst/mt4115_pciconf1 - PCI configuration cycles access. /dev/mst/mt4115_pciconf2 - PCI configuration cycles access. /dev/mst/mt4115_pciconf3 - PCI configuration cycles access. ~$ ibv_devinfo | grep -e "hca_id\|link_layer"
The following output indicates the ports are configured for InfiniBand. The following output indicates the ports are configured for Ethernet. Make sure that you have installed the Mellanox Software Tools (MST) services and have started running them as explain in the section Downloading and Starting the Mellanox Software Tools. Change the configuration for all four ports to Ethernet. Verify the configuration changes have been applied. ~$ sudo mlxconfig query |grep -e "LINK_TYPE\|PCI\ device"
Note: These changes will not take place until the server is rebooted. After the DGX-1 is back online, make sure that Ethernet is the active link layer. ~$ ibv_devinfo |grep -e "hca_id\|link_layer"
Change the configuration for all four ports to InfiniBand. After the DGX-1 is back online, make sure that InfiniBand is the active link layer. There are two USB 3.0 ports on the DGX-1. 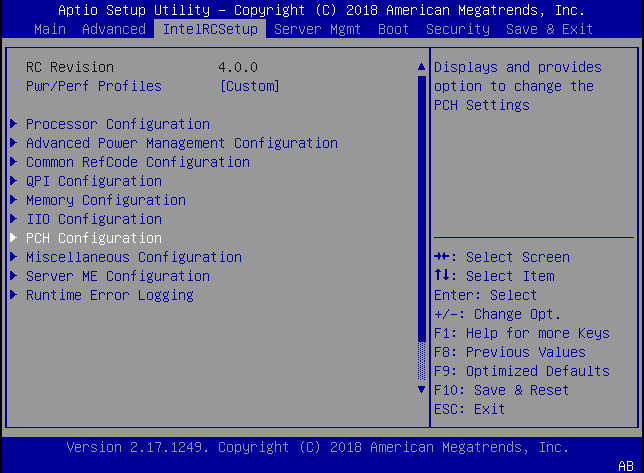 However, they are set up as USB 2.0 by default in the system BIOS. 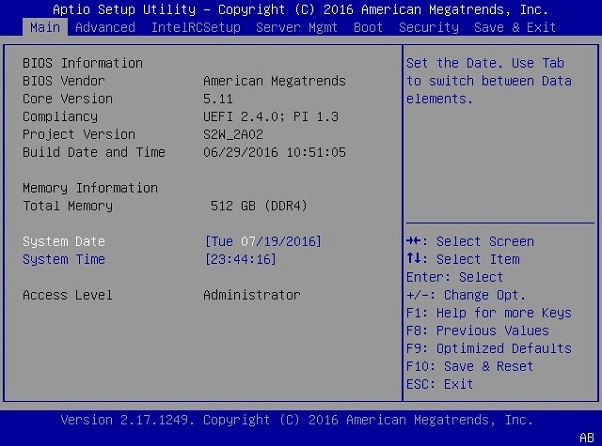 To obtain USB 3.0 performance, you must enable USB 3.0 in the system BIOS as explained in this section. 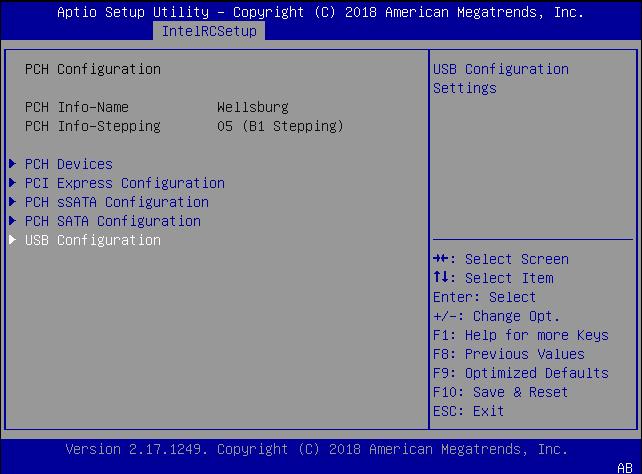 Select the IntelRCSetup tab from the top menu, then scroll down to USB Configuration and press Enter. From the IntelRCSetup screen, scroll down to PCH Configuration and press Enter. Scroll to xHCI Mode and press Enter, then select Enabled at the xHCI Mode dialog and press Enter. Press F10, then select Yes at the confirmation pop-up and press Enter. USB 3.0 is enabled upon system reboot.